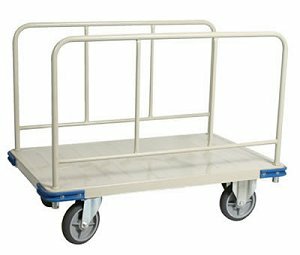 Wesco Panel Platform Truck helps you easily move large, bulky items. This platform truck provides rubber wheels that won't mar floors and corner bumpers that keep walls from getting nicked and scratched. Two swivel casters make the unit a cinch to maneuver. • Ideal for commercial applications. • 1,100 lbs load capacity. • Platform size: 30" x 48". • 8" mold-on non-marking TPR rubber wheels. • Casters: two swivel, two rigid.